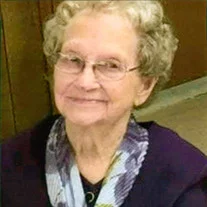 Lucy Juanita Baird Parlier, age 100, passed away on Saturday, January 26, 2019 in the Ivy Hall Nursing Home, Elizabethton, Tennessee. She was born in Matney, North Carolina to the late Alexander and Bertha Annis Hubbard Baird. She was also preceded in death by her husband Quincy Joseph Parlier, one son, Joe Parlier, one daughter, Brenda Nidiffer, and a granddaughter, Rebecca Bachart, five sisters, Otha Wilson, Mary Greer, Claty Hartley, Pheoba Smith and Lois Bolick, and two brothers, Lester Baird and Lewis Baird. Lucy was the retired owner/operator of Biltmore Cleaners and a homemaker. She was a member of Borderview Christian Church. Lucy loved to quilt, watch the Braves on television and play Rook. Those left to cherish Lucy’s memory are two sons, Allen Parlier and wife, Karen of Elizabethton and Kenneth Parlier and wife, Betty of Greeneville, Tennessee, one daughter-in-law, Marie Parlier of Elizabethton, seven grandchildren, thirteen great-grandchildren and 5 great-great-grandchildren. She is also survived by a special niece, Mary Jo Earp and special friend Mary Evelyn Arnold and several other nieces and nephews. A service to celebrate the life of Lucy will be held at 7:00 PM Monday, January 28, 2019 in the Chapel of Peace at Tetrick Funeral Home, Elizabethton, Tennessee with Mr. Scott Fisher and Mr. Randy Carrier, ministers officiating. The music will be under the direction of Scott Reynolds and the Borderview Christian Church Quartet. The family will receive friends at the funeral home from 5:00 PM to 7:00 on Monday, prior to the service. The graveside service and interment will be conducted at 11:00 AM, Tuesday, January 29, 2019 at Happy Valley Memorial Park. Active pallbearers will be selected from her family and friends. Honorary pallbearers will be her church family. Those attending the graveside service are asked to meet at Tetrick Funeral Home at 10:15 AM to go in procession to the cemetery. Lucy’s family wish to extend a special thank you to the staff of Ivy Hall Nursing Home and Dr.Schoondyke for the loving care given to Mrs. Parlier. Those who prefer memorials in lieu of flowers may make donations to Borderview Christian Church, 1338 Bristol Highway, Elizabethton, Tennessee 37643.